​Run by husband and wife team Steve and Karen Robertson who moved back to Steve's native Fife after a successful stint running The Glass House Restaurant in Speyside. They have now carved out a reputation as one of the top restaurants in the area. Fresh ingredients from local artisan suppliers are sourced to create mouth-watering dishes for the seasonally changing menu’s. The team of award winning chefs create a range of modern Scottish dishes which are not over complicated and let the flavours speak for themselves. ​As well as lunch and dinner the restaurant serves morning coffees, homemade pastries & breakfasts from 10am and Afternoon Teas (booking required) on Sundays between 3pm and 5pm. Front of house is friendly, relaxed and informal – the décor modern contemporary with impressive designs… Nothing has been overlooked which makes them stand out from the crowd and definitely worth a detour. There’s a reason The View is called The View - it has one of the most impressive views over the River Tay. On a summer’s day, it's clear, sparkling and beautiful. When the weather isn't quite so accommodating, it's dramatic, striking and ever changing. 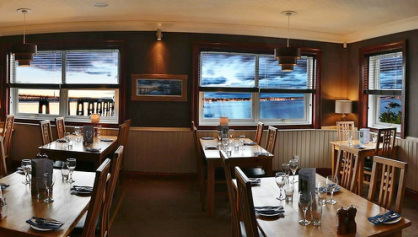 It’s the perfect venue for exclusive private functions such as Birthdays, Anniversaries or Weddings with stunning views across the Tay and catering for up to 70 people its ideally equipped for any special occasion.